So for my big painting I did a tattoo design to put onto my model. I wanted to make the fem fetal seem even more menacing. 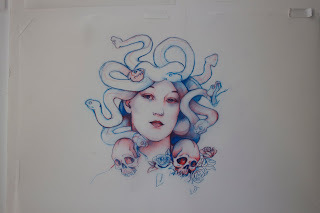 Giving her a tattoo instantly made her seem hard and intense; choosing the Medusa was so that you would feel uncomfortable, you shouldn't be looking at her at all because you would die. I intended it to be a chest piece, so it also has more to the design that spread out on both sides. You will see when you look at my painting.